What does God call Golden Syrup? If you ask a native, Yorkshire is “God’s Own Country”. Yorkshire, they tell us, is a bit different than everywhere else. And as outsiders (but frequent visitors) we would have to agree. Yorkshire is different, but mainly in a good way. The Yorkshire Dales, stretching from Sedbergh to Skipton and including the “Three Peaks” is one of the most beautiful areas of England. Cities such as Leeds and York are diverse and historic respectively; places such as Ripon and Harrogate are famous and beautiful tourist destinations; and The North York Moors encompasses wild landscapes and famous seaside towns such as Scarborough and Whitby – home to Dracula! But it’s not just the countryside which is distinctive. Yorkshire has it’s own traditions and even it’s own dialect. Every time we travel to Yorkshire (which is whenever someone hires our mobile crepe van – usually for a wedding but sometimes for a party) we encounter one of these “Yorkshireisms”. One of the flavours of crepe on our menu is particularly popular at weddings and events in Yorkshire. It’s fairly popular everywhere else too, but even more so in that part of the UK. And that flavour is Golden Syrup. But in Yorkshire, it is not commonly known as Golden Syrup: it’s usually called ‘treacle’. We are getting used to this anomaly now. There was a time we would have to explain to wedding guests that we didn’t offer treacle and instead they could choose any one of the twenty or so other flavours of crêpe displayed on our menu. This was always met with a confused look and a repeat of the request: ‘I’d like a treacle pancake please.’ It took as a while to understand that in God’s Own Country, treacle actually means golden syrup. We aren’t sure why, but it does. And as a result, we always take extra “treacle” for our crepes at Yorkshire weddings, because it’s unusually popular there. As time went on, and we experienced this phenomenon more frequently, the whole treacle/golden syrup thing got us intrigued. It only happens in this part of the world. It also happens every time our creperie is hired for a wedding in Yorkshire. So what is it all about? We’ve searched on Google and found no answers as to why there is this particular quirk but it definitely does exist (but as they say, God does move in mysterious ways, so I guess he can do what he likes in his own country). The main returns when seaching for “treacle and “Yorkshire” relate to parkin: a delightfully sweet, sticky cake which is apparently quite difficult to cook correctly. But when “treacle” itself is investigated, things become slightly clearer: Golden Syrup is a actually a variety of treacle. ‘Treacle’ is the term for a by-product of the sugar refing process. This by-product is in liquid form, and after further processing, a liquid called ‘treacle’ (of which there are many types) remains. So molasses is a type of treacle. 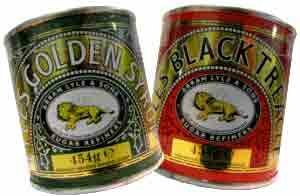 ‘Golden syrup’ is a type of treacle. And (what should technically be called) ‘Black treacle’ is of course, a type of treacle. All of which means that when someone from Yorkshire orders a treacle pancake (whether at a wedding or anywhere else for that matter), then it is very important that you do not try to correct the apparent mistake. Because if you did, you would actually be very wrong and they would be very right. Which, if you’ve ever been to Yorkshire, you’ll know is very often the case.